New Year’s eve was always festive, exciting, and Amá would mark and celebrate every new year by making buñuelos. They are delicious, crisp, light. I recall having a sense of wonder at how she made ribbons out of tortillas. Now when I make these in my own kitchen I recall happy times with amá, apá and all my brothers and sisters. These are as “party nice” today as they were when I was a child. I cut and shape them just like mom did. The origin of the name, “buñuelo,” is not clear, but the historical origins of this pastry are Arabic. Remember that Spain was an Arab country for 800 years, until 1942. In Granada, Spanish/Arabic kitchens made buñuelos by first frying the wheat pastries and then dipping them in boiling honey. We in the Texas Mexican region use sugar, not honey, and we add the wonderfully aromatic “Canela,” Mexican cinnamon. We start by making a sweetened version of regular flour tortillas. Mom mixed everything by hand, but I use a food processor (It’s quick).There are three things to keep in mind when making wheat tortillas. First knead the dough thoroughly– put your back into it! Vigorous kneading changes the structure of the wheat proteins to create strands of gluten that will eventually provide the structure and elasticity in the tortilla. Second, let the dough rest for 20 minutes after kneading it. And third make a “testal,” by rotating a ball of dough with your hands while pinching the edges and folding them under to fashion a little round pillow that has an indentation on the underside.The word “testal” is from the Nahuatl word, “Téxtatl” and refers originally to the ball of corn masa that is used to make corn tortillas. 1. In a food processor, with the blade attachment, place the dry ingredients pulse a couple of times to mix all the ingredients thoroughly. 2. Add the shortening and process until the shortening is completely blended, about 10 seconds. There will be no granules, but if you squeeze the flour between your fingers, it will stick together. 4. Place the dough in a bowl or cutting board and knead it with gusto for 6 minutes until it is shiny and definitely elastic. Let it rest, covered, for 20 minutes. 6. 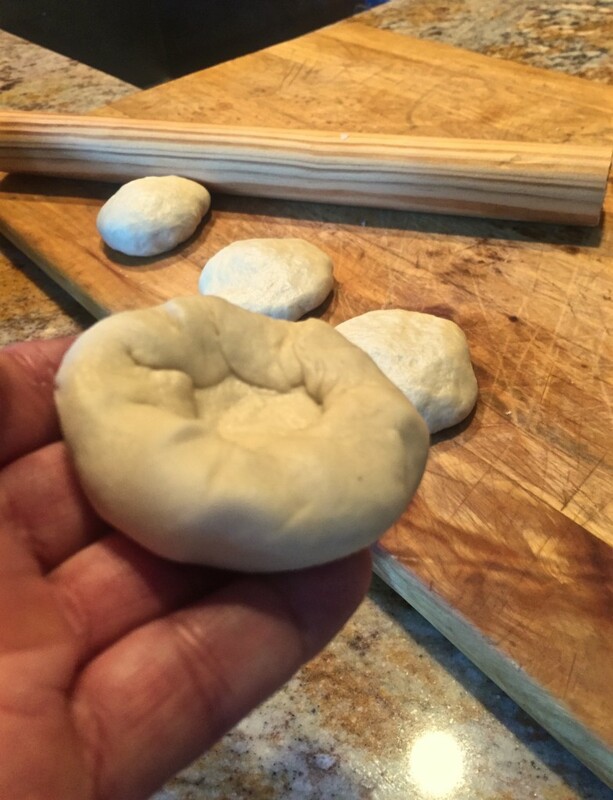 Use a “palote”, rolling pin, to roll each round tortilla to a thickness of 1/8 inch. You can proceed to step #8 and fry the tortillas if you want round buñuelos. 7. Cut each tortilla into 2″ wide strips. In the middle of each strip, cut a slit lengthwise with a knife, leaving 1 inch on each end uncut. Take each strip and insert one end through the slit, twisting as in the picture, to form a swirling ribbon. 8. In a deep skillet, heat peanut oil to very hot, shimmering, 350 F. Fry the buñuelos, turning so that both sides turn golden. This will take about 2 minutes. 9. 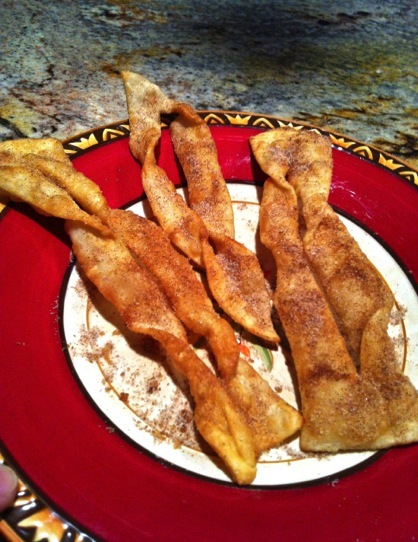 Place on paper towels and sprinkle with generous dashes of the cinnamon sugar. Wishing you and your family a new year full of health, love and safe surround. ¡Feliz Año Nuevo!